It's here. The race that teams have marked upon their calenders with a big red circle is now upon us. Being one of the "wild card" tracks on the circuit, you can't blame teams for being a little antsy of the largest, fastest, and most unforgiving track on the entire circuit. Since everyone is on equal horsepower at these restrictor-plate races, anyone can pounce on the opportunity of a possible victory. After all, who could have predicted Dave Blaney's 3rd-place run last fall, or NASCAR newcomer Brad Keselowski grabbing victory in 2009? Regardless of whether it's underdogs or favorites leading the field, the Aaron's 499 is bound to be full of pure excitement every lap. 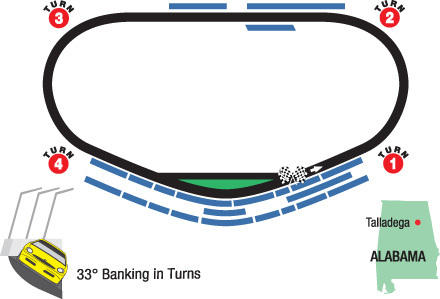 Located in the small county of Talladega, Alabama, this 2.66-mile behemoth track is banked a steep 33 degrees in the turns, 18 degrees in the tri-oval, 16 degrees in the chutes (the straight areas from the end of Turn 4 to the start of the tri-oval, and from the end of the tri-oval to Turn 1), while the 4,000 foot-long backstretch is 2 degrees. But as if that isn't enough to make an extremely fast and competitive racing circuit, the entire track is 48 feet wide, which means cars can race 3-or-4 wide with ease. While the pace car will top out at a series-fastest 70mph, the speed limit on pit road is 55mph. It is well-known that Dega is one of only two tracks on the schedule (the other being Daytona International Speedway) that features restrictor plates. It makes for close, almost-touching action in which any small bobble could take out half the field. One of the headlining stories the past year and a half or so has been the actual method of racing here. For the past 2 decades, the racing was dominated by large packs running from twenty to thirty cars, inches apart and 3 wide. But a change was sparked in late 2010. What caused it, no one is sure. There were no major aerodynamic changes, no new parts, nothing. But during the Talladega fall race of that year, drivers started running in a two-by-two form, one steering and another pushing. It was a form of racing still using drafting, but with only two drivers instead of 30. This new type of competition was hated by the fans, being dubbed the "two-car tango". Attendance and TV ratings plummeted for all restrictor-plate events, and NASCAR was stuck in desperation mode trying to rid of this racing technique. As it is well-known by now, the sport accomplished what it set out to do earlier this year, breaking up the two-car tandem and bringing back pack racing just in time for the Daytona 500. Will their successes carry over to this circuit? We'll have to wait and see. The key for drivers in this race is overheating. With either style of racing, drivers are almost always constantly behind another car. That means cars face the possibility of overheating and blowing their engines. Another key is timing. Many drivers have different driving styles to avoid the "Big One", as some drivers (like Jeff Gordon and Carl Edwards) like to hang in the back until 10 laps to go, then attempt to charge to the lead. Others (like Kevin Harvick and Kyle Busch) prefer to try and stay in front the entire race long, and block the oncoming drivers. Watch your driver(s) carefully throughout the race and see which driving style they're using. For your Fantasy teams, this is an extremely risky race, because while nearly everyone can contend for the win, they can just as easily be caught up in a wreck. So no pick is "for sure". But some of the drivers I would advise putting on your team nevertheless are Clint Bowyer and Kevin Harvick. They clearly stand out above the rest of the pack when it comes to finishing the races, and finishing well at that. First off, Bowyer is the guy you need to have on everyone of your Fantasy rosters this week. With three consecutive finishes inside the top 3, including a pair of wins, don't let his move to Michael Waltrip Racing fool you. This guy is great, and now without the two-car-tandem, he doesn't need to rely on his RCR teammates to run great. Speaking of RCR, Kevin Harvick is also a great buy. Bowyer's "wing-man" for those races, he also grabbed 3 top fives, along with winning that other race that Bowyer didn't. Combined, these two have led 116 of the past 564 laps here, which is remarkable considering each of the Talladega races went through at least 72 lead changes. As for dark horses, Talladega is kind to them. Ever since no-name Richard Brickhouse won the inaugural race here back in 1969, there has been more than a few first-time winners. In fact, 10 drivers have grabbed their first career victory here before. Among the drivers I feel have a good shot at grabbing their first career win this weekend: A.J. Allmendinger and Aric Almirola. Both have had strong runs before (Dover for the Dinger and Homestead for Almirola), but this week at Talladega could be when they break through. You really can't go wrong with anybody here at Dega, because everyone can win and lead laps. So while I won't give a definite pick on who will run bad, both Ryan Newman and Marcos Ambrose have struggled here. Both have an average finish of worse than 30th since 2010, and they have finished in the top 20 a combined once, a 19th-place finish by Ambrose last fall. The weekend schedule for the Cup Series consists of two practices on Friday, at 2pm and 3:30pm ET. Qualifying is Saturday at noon, right before the Nationwide race. FOX's broadcast the Aaron's 499 (oddly enough, 500.8 miles/188 laps) begins at noon Sunday before the green flag is scheduled to drop at 1:19pm. Thanks, Rowdy. I'm not sure yet, but I might. Unless you wanted them to start the race in the middle of the first corner. v Yeah, and 2.66 doesn't really make it easy to get exactly 500, 400 or whatever-hundred miles you want. Probably because of the track length. That doesn't really lend itself to a flat mile distance.